cone crusher / mobile / crawler / compact RM V550GO! The track-mounted mobile cone crusher CC 80 T is the smallest model of this series. Thanks to its low weight and short set-up times, it offers additional flexibility. A cone crusher is used to break blocks of mineral matter into smaller pieces of a desired size. The material is crushed between an eccentrically rotating cone and a concave hopper, both reinforced with a wear-resistant surface. Material introduced from above wedges between the cone and hopper surfaces and is crushed. The smaller pieces slip down, wedge again and are further reduced in size. The process continues until the desired size is obtained. 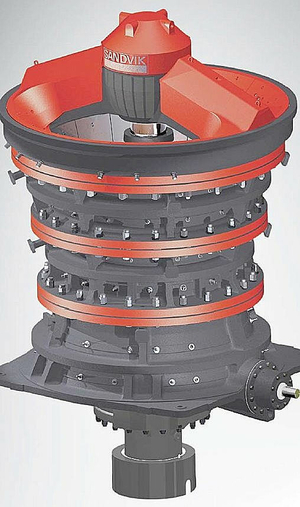 Cone crushers are common in mining and quarrying, where they perform secondary and tertiary crushing of semi-hard to hard materials.